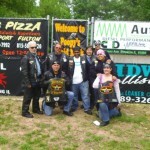 On June 2 2013 members of 357 Brotherhood and Bro Kabog from Knights of Solomon joined together to support Total Velocity’s Motorcycle Association’s charity ride. It was a great ride to Poopy’s, where we had a great lunch. 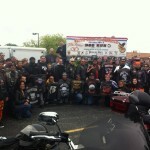 Thanks to Chili, Shiv, Papa Smurf, Black Jack, Cookie, and Lady’s Joy, Connie, and Otis for coming out and supporting this great ride in the name of the chapter.